Winter is the time of year when many people find problems with their boilers rear their ugly heads, or sometimes even stop working altogether. While it’s a nightmare to find that you’ve got no heating and hot water in your home, it can be good to know that the issue can be rectified pretty quickly. We offer repairs and installation of a range of central heating systems in Loughborough and the surrounding areas that can bring welcome and fast relief to a house that has just become icy thanks to boiler problems. So, if you’ve decided to get a new boiler installed, you might be wondering about the different types of central heating in Loughborough that are available. These days, there are plenty of boilers to choose from, depending on the size of your home and the availability of space in it. Here’s a handy guide below. This is the most popular type of boiler used in homes across the UK, because it is great for saving money. That’s because it only heats up the water that you use, so there’s less energy wasted in heating water that you don’t need. And when you need hot water, there’s no worrying about it running out either, because it’s taken and heated directly from the mains. This fact also means there’s no need for a large hot water cylinder or cold water tank (although it can take a couple of seconds to heat that water up). Combi boilers are great for smaller homes, when there’s not the space for a tank and are quicker to install, because there are less parts to it. If used in a larger home though, bear in mind that if a few taps are being used at the same time, it can affect the flow. This is the traditional kind of boiler that requires space for a hot water cylinder and cold water tank, however it’s great for larger homes that have a lot of bathrooms, because the flow of hot water isn’t affected. Despite the fact that you are limited on hot water, because it will only allow as much as the tank will hold, this is rarely a problem, due to the size of the tank. So, you can ensure lots of hot water can get to lots of taps, all at the same time and it can also come with an electric immersion heater as backup if the boiler breaks. 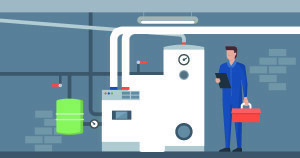 These are very similar to conventional or regular boilers, but are considered to be more economical and take up less space, because many of the major components are built in. It also provides a faster response for hot water than the combi boiler, which is thought to be an economical option. These are perfect for large houses where there isn’t much space to house a large tank. If you would like to find out more about the kind of boilers that you could have installed in your Loughborough home, then get in touch with us today for a friendly chat about the many options available.